123 Vogel St, an action about council process? Where to start. Here we have an award winning redevelopment of a substantial old warehouse for new commercial use. Reading the Otago Daily Times today we learn a local businessman questions council process on consenting grounds – apparently, there was an ‘administrative error’ with a set(s) of drawings, and a condition of the resource consent issued for 123 Vogel St was neither correctly tracked or enforced. Rightly, the businessman doesn’t wish to litigate the matter through the newspaper. The building owner to his credit has made a large and worthy investment in the building structure and its upgrade for commercial occupancy, revitalising a large segment of the block running between Vogel and Cumberland streets. 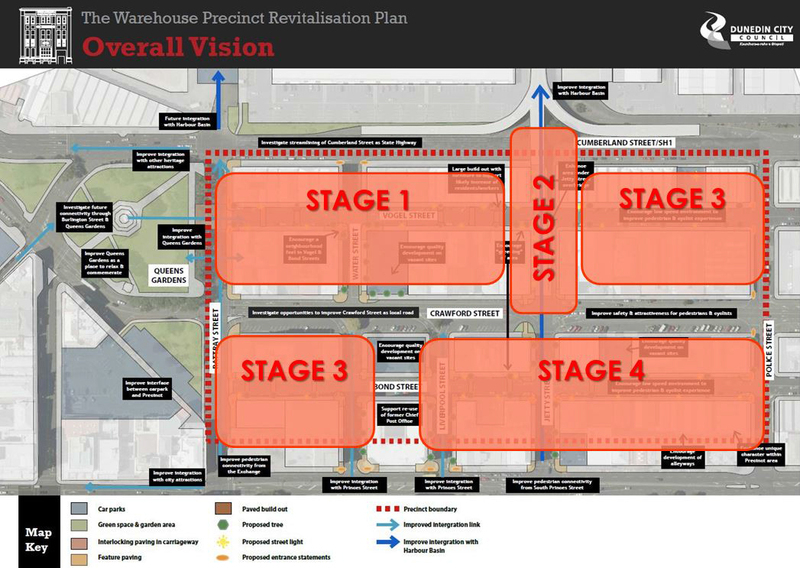 Why then would an ungenerous attack by one party not closely involved in the proposed warehouse precinct, be lobbed at this one building owner in such negative and disastrous fashion. What is at stake. More importantly, what does bringing the action do to enhance the historic built environment, commercial property development, and council processes – if ad hocism (planning rules enforced here, and not there?) is argued as ‘state of play’. Is there any good in an Environment Court challenge – is it ‘vexatious’. Impartiality, transparency, technical proficiency and fairmindedness is the hoped-for collective quality to be seen in any council operation, particularly in regards to planning matters. 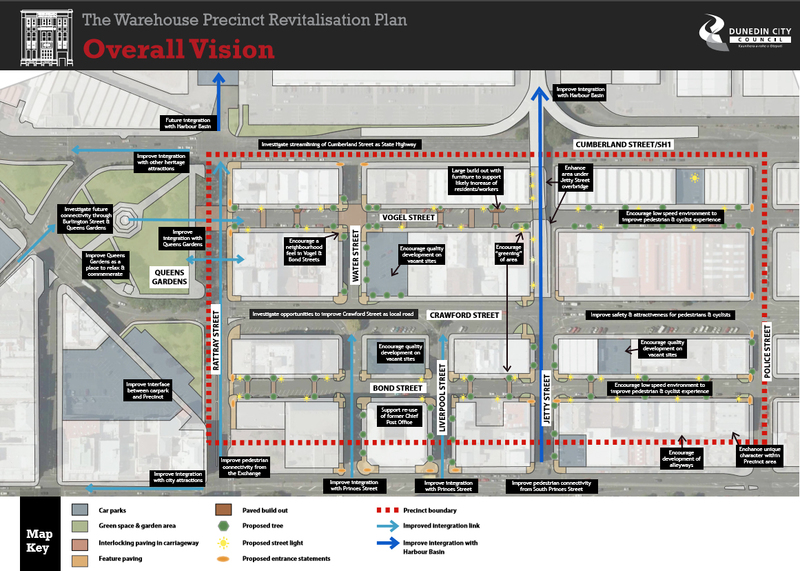 How far can ‘the managers’ of the District Plan, a community owned living document, seek room to breathe —or indeed, treat every resource consent application on its individual merits ….for positive precinct and in-zone outcomes, for the avoidance of new (adverse) precedents or laxity of interpretation where the rules go swimming. Where does the line bite. In practical terms we read that what was built (window-wise at second floor level) does not accord with what was granted by resource consent. We see minorly dropped sills (pretty? hmm) and a small extra pane of glass added for greater daylighting and liveability, done in such a way that the original scale and depth of the windows remains readable. The intervention isn’t screaming. It is very quiet, and reasonable? Why then did someone fudge the option to be consented. Who did not enforce the agreed design solution? Were affected parties given all proper information as the application processed to decision? Does the error set a precedent for destruction of protected facades and heritage townscape? This most certainly can be argued and tested generally and legally – but probably not with 123 Vogel St hauled to centre stage, pointing up administrative error or wilful and confused intention at DCC if that could be shown…. The second generation district plan public consultation process is perhaps the best place to locate the discussion. Not here, unless there is something else forming the agenda for the current challenge. Recently, there has been another example of ‘sill dropping’ in the precinct (TH13) at the corner of Rattray and Cumberland Sts. Most people – heritage advocates included – would view the degree of change to sill height as rather subtle in the context of the overall historic heritage ‘Save’. But these details niggle aesthetes and the conscientious. Is the effect (of design subtleties – a broad tradition….) to cumulatively – with more than minor effect – destroy ‘old’ townscape in the Vogel Street Heritage Precinct, other heritage and townscape precincts, and more widely across the central city —the ‘sense of place’ (held by ‘original’ built fabric) that District Plan policy and rules are designed to constrain, curbing overt changes to external building appearance? How on earth did this happen at the council? Perhaps the challenge and subsequent ruling (win or lose) will ensure that all comers receive the same level of service in the adminstration of consents and conditions, and the intent of District Plan rules is more strictly adhered to by council planners. Everyone is entitled to their day in court. The other hope is that DCC is meeting all of Mr Barnes’ legal costs. If that was the fight advertised on page 1 today. OPTION ONE STAYED IN THE CONSENT DECISION …. Option one would have had a new sash and two panes of glass, instead of what was built. 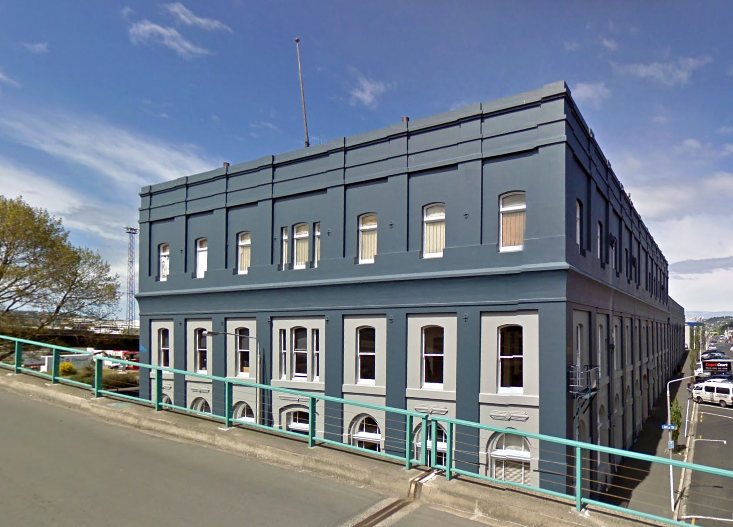 The owner of an award-winning Dunedin warehouse precinct building has been called to face the Environment Court in a case he described yesterday as “vexatious”. The court action calls on 123 Vogel St owner Chris Barnes to remove windows on the second floor and replace them with a design applicant Dunedin businessman John Evans says should have been built under the building’s resource consent. Court documents from Mr Barnes’ counsel describe the action as “utterly baffling”. Mr Barnes has questioned the intentions of Mr Evans, and the court documents ask who Mr Evans is representing, and whether he is “receiving funds from a third party”. Some people involved would not speak on the record but one claimed property interests in “the big end of town” were behind what they saw as an attack on the precinct. 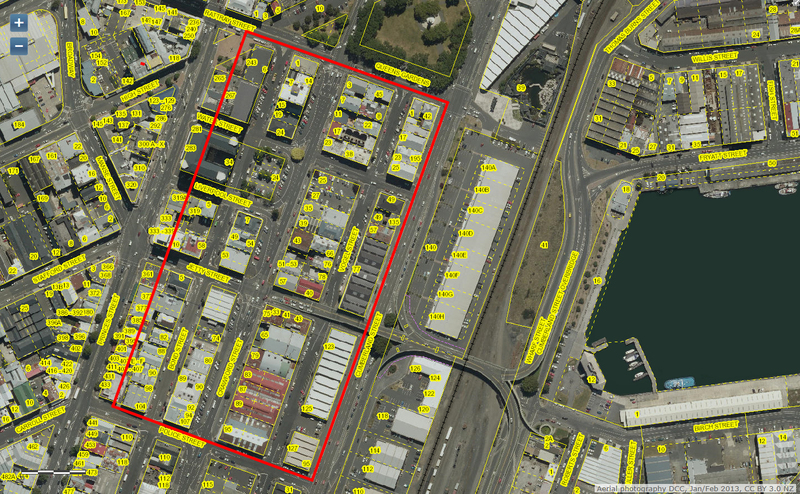 […] Mr Evans’ application referred to a condition in the resource consent. 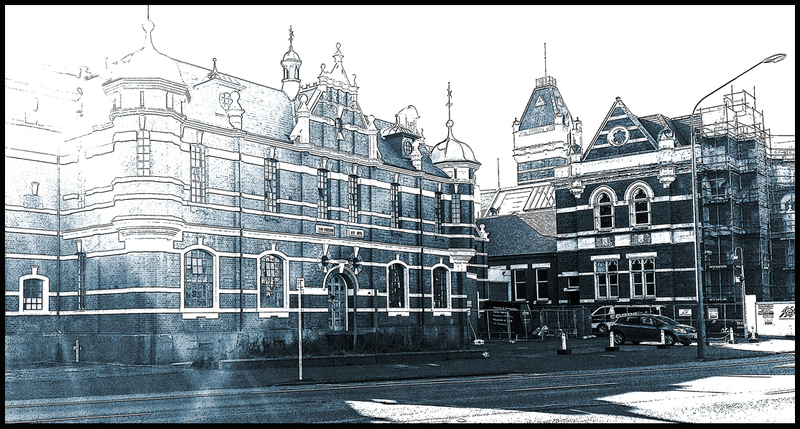 28.10.14 Dunedin’s “period architecture”, not so quaintly…. 19.2.11 Reed Building, 75 Crawford Street for demolition? Goodbye Stewart Harvey, you good thing! 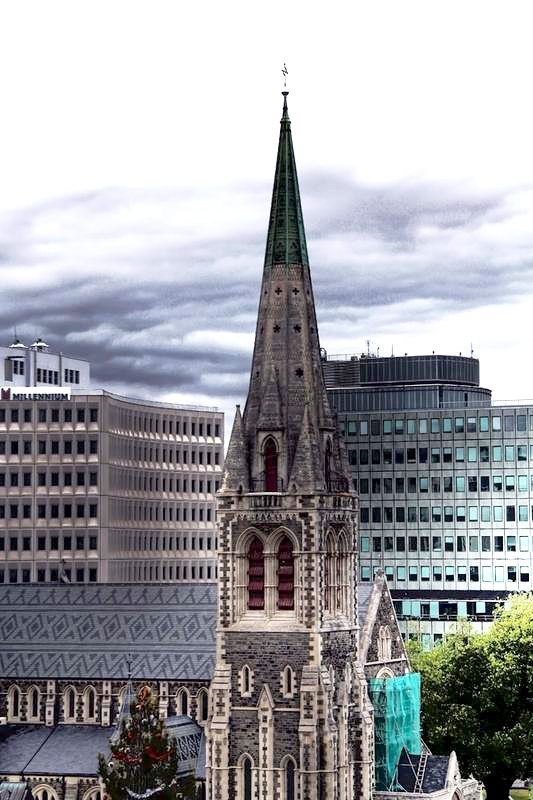 While Bishop Victoria and the Anglican church property trust (CPT) continue to sit on their hands perhaps awaiting devine intervention, who knew, it turns out that a group of stalwart people in New Zealand – with an incredible level of international assistance – are busy planning a very special Cathedral project. Below is a link to a video clip of the People’s Steeple proposal being demonstrated by its creator Marcus Brandt. 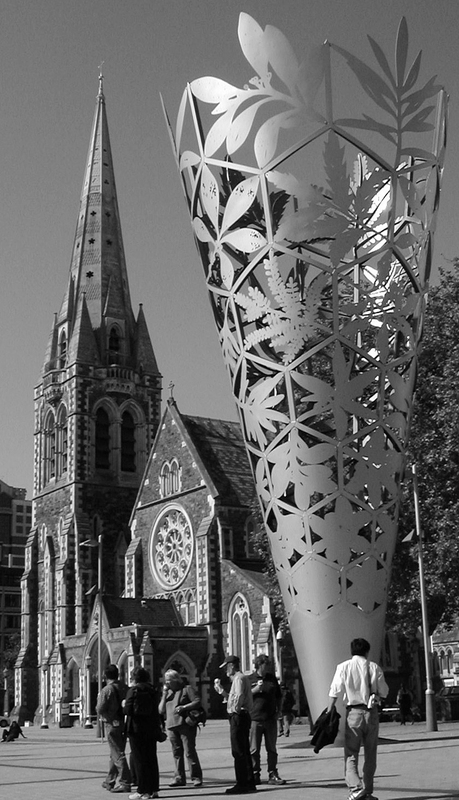 Marcus has been in CHCH this last week promoting the People’s Steeple Project. The People’s Steeple is a mind blowing proposal…audacious, visionary, inspiring. Lifting telescoping timber sections of the spire 60 metres into the sky…powered by about 500 trained people working 16 capstan winches placed around Cathedral Square, watched by up to 50,000 people in the Square. The US based Timber Framers Guild (TFG), a professional organisation of engineers and timber framers has offered to be the lead contractor to build, assemble, and erect the People’s Steeple. The lead NZ engineers would be renowned CHCH timber engineer – Prof Andy Buchanan whose report on the project is attached. Skilled TFG members from the US and around the world would gift their time, working in the Square preparing and assembling the timbers, and then helping lead the steeple’s erection. Up to 300 TFG members along with locals could be involved working in the Square over a period of about 6 months. The TFG have successfully undertaken 75 community building projects over the last 25 years in the US and around the world. They are super keen to offer their services to CHCH. The TFG emphasise their projects are about ‘building communities’. Marcus says would take only 2-3 hrs to lift and secure the telescoping sections. 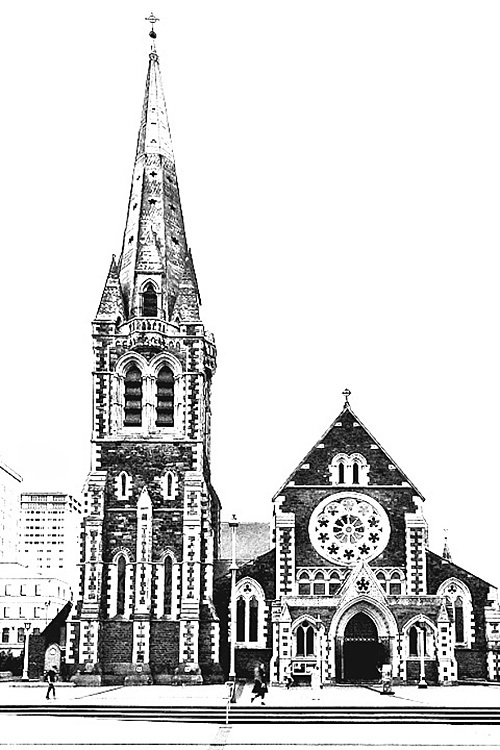 Flooring and bells would be assembled the same day and in the evening the bells would ring out…proclaiming to the world – ‘Christchurch is back’….and a Hangi feast would be opened…for a crowd of 50,000! International media would broadcast the event around the world…the whole enterprise being about engaging our community in the most positive way…and it would ignite fund raising for the restoration of the cathedral. It is envisaged the construction of the People’s Steeple would lead restoration of the cathedral and the Square. It is noted huge pro bono contributions from the Guild’s members are being offered, and Blakely Pacific NZ Ltd, a US based forestry company has offered to provide the timbers at no cost from giant 125-year-old Port Orford Cedar from its Pioneer Forest in South Canterbury. 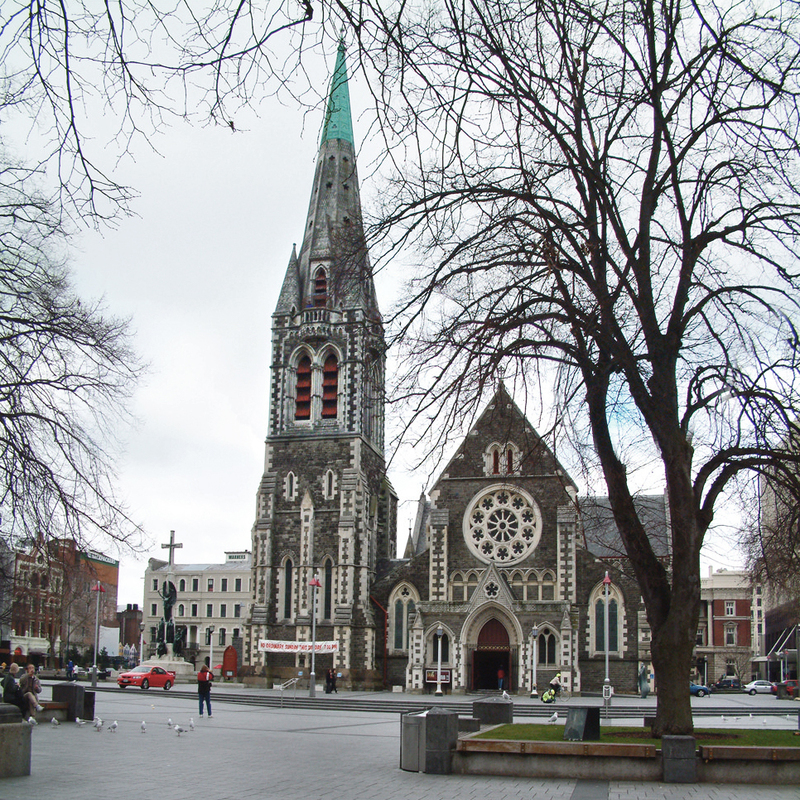 The Restore Christchurch Cathedral Group is strongly supportive of the People’s Steeple. 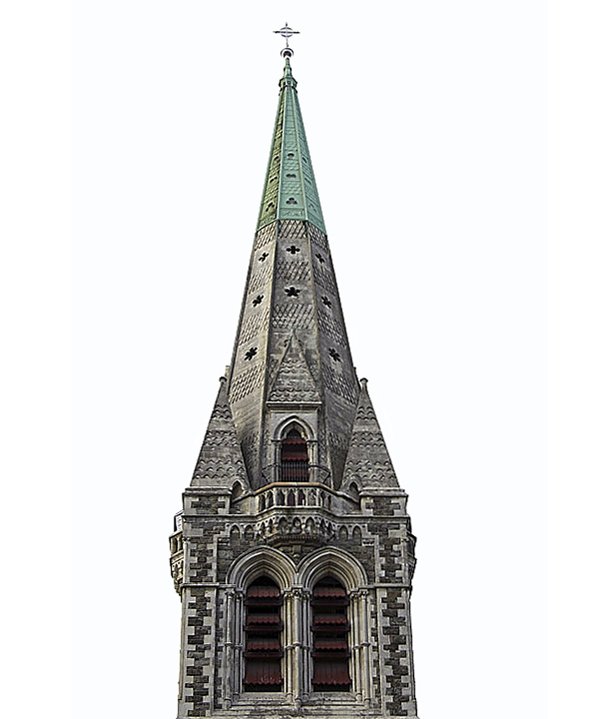 We hope this inspiring project will help engage and enthuse Christchurch people with recovery of the cathedral, and help get the cathedral restoration programme underway. See attached reports by Marcus Brandt, Andy Buchanan, and the TFG. For the last thirty years or so, I’ve been restoring historic stone and timber buildings, mostly in Southeastern Pennsylvania. I’m a working master carpenter and stone mason. Most of the historic buildings I am called to work on are 150 to 300 years old. Solid and well crafted, these old buildings tend to age well, but neglect and damage can take a toll. Much of my effort is spent in repairing and strengthening the timber frames of barns, bridges, houses, gristmills and churches. I’ve had several commissions to build new structures in the old style. I have organized and led many barn raisings, in which hundreds of volunteers gather to raise a barn’s frame in a day. A good crew will have the sides and roof on too. Straightening, plumbing and repairing damaged stone walls is often called for. It is not uncommon to straighten a wall 10 meters high that is out of plumb by 400 or 500 mm. Having studied and worked with several Scots masons, I’m a strong believer in lime based mortars and good masonry practice. The interface between stone and timber is of particular interest to me. Since 1989, I’ve been a professional member of the Timber Framers Guild (TFG) and a member of the Traditional Timberframe Research and Advisory Group (TTRAG). That part of the Guild focuses on understanding the past practice of the craft with a view that the past might help inform future practice. I have advised many historical and preservation societies and sat on many review boards. As a result of my participation in Guild efforts and projects, I was invited to go to both Scotland and China to investigate “lost” technologies for the Public Broadcast Service series NOVA. We built working siege weapons in Scotland and in China we built a bridge design that hadn’t been built since the Mongol invasion. I teach Traditional building skills at Lehigh University, Bethlehem, PA. I’m particularly interested in ways that the pre-industrial past practice can inform building in the greener, sustainable post-industrial world of the future. I serve as a sailor, boson and ship’s carpenter aboard the tall ship Gazela (www.Gazela.org). That experience has taught me much about rigging and raising heavy loads in confined spaces. It’s taught me about erecting tall, secure, flexible, stable structures that get tossed about and shaken mercilessly. A sea captain in her own right, my wife serves as First Mate aboard Gazela. She out-ranks me, and helps keep me humble. Since 22 February, I have been working as much as possible to develop a method to rebuild the Bell tower at Christchurch. With the help of friends and students, and the forbearance of my wife, I developed a plan that is beautiful, solid, strong, flexible, earthquake resistant, buildable, durable, and familiar. But more than anything, I want to use the rebuilding of the steeple as a vehicle for rebuilding and strengthening the community. And, once built, serve as an outward witness to the inward love we have for each other as fellow humans. I look forward to doing this project with the able help of my best friends in the world…many of whom I haven’t yet met. In case you missed the ODT four-part series on Dunedin’s residential heritage in late December….. here it is, via Dave Cannan’s The Wash (Facebook). █ The four parts, abridged for quick reference and linked here below, had an excellent (research) information follow-up by Kim Dungey. Some very approximate dates have been added care of Quality Value (QV), these are based on (limited) property records held by councils; as well as year dates for historical architects, where known. Streets of Gold, a Summer Times series celebrating Dunedin’s rich architectural heritage. In collaboration with Heritage New Zealand researchers Heather Bauchop and Susan Irvine, with additional research by David Murray, archivist, Hocken Collections; and Alison Breese, archivist, Dunedin City Council. High Street has an association with the medical profession dating back to the 1880s, when the Mornington cable car started running and some impressive new houses were built along its route. CAVENDISH CHAMBERS, 211 High St. The company behind the venture, Medical Buildings Ltd, was incorporated on March 1, 1926, and the shareholders all took professional rooms in the new property. The building was completed in 1927. Architect: Eric Miller (1896-1948). This prominent residence (QV: c.1900?) with a turret and projecting windows was designed in 1888 for Scottish-born Dr Frank Ogston. Ogston gained his medical degree in Aberdeen and emigrated to Dunedin in 1886 to take up a position as a lecturer in medical jurisprudence and hygiene at the University of Otago. Architect: Henry Hardy (1830-1908), and builder-developer. An Arts and Crafts-style design, the house (QV: c.1909?) is finished in roughcast with brick exposed on the ground floor sills. It was built for Dr D.E. Williams and his family as a private residence and doctor’s surgery and was home to the Williams family until the 1960s. Architect: Basil Hooper (1876-1960). Built in 1904, the Chalet Hospital (a private facility) was described as being “finished in coloured and tuck-pointed brickwork … the whole of the relief and ornament is carried out in bold cornices over the windows”. Architect: John Louis Salmond (1868-1950). York Place features two large homes once owned by members of the Speight family. It is unclear exactly when the villa was built. Coppersmith Alexander Burt, of A and T Burt, married Janet Crawford in 1866 (they had a family of six sons and three daughters) and the couple were living in York Pl by July 1868 when Janet gave birth to a son at the house. Built for Jessie and Charles Speight after their marriage in 1898, the residence appears in the Dunedin City Council rates records in the 1899-1900 year. Architect: J.L. Salmond. The residence of Charles and Jessie Speight from the time it was built in 1915, it remained in the Speight family until 1960. Bearing a strong resemblance to the Theomin family’s Olveston (built 1907, designed by Sir Ernest George). Architect: John Brown (1875-1923), a neighbour. Known more than a century ago as Mrs Turnbull’s Grocery Store, this unusual wedge-shaped building began life as a home, stables and shop built for John and Janet Turnbull in 1875. In January 1875 tenders were invited for a two-storey dwelling and shop to be constructed of wood. Architect and Surveyor: E.J. Sanders [aka Saunders]. Highgate has a fascinating and storied collection of prominent dwellings. Thought to have originated as a single-storey bluestone house with a central front door and double hung windows on each side. A second storey was later added. The exterior walls were built of double stone – more than 70cm thick – and the interior walls of double brick. With its wrought iron lacework, it has been described as one of the “finest examples of classic Victorian architecture in Dunedin”. Home of businessman Andrew McFarlane (1842-1904) and his wife Jane Wilson (1847-1920). By the 1890s, the family referred to their home as “Renfrew House”. Architect: credited to Nathaniel Wales (1832-1903), a neighbour. Designed in 1900 for dredging tycoon Alexander McGeorge, this grand residence reflects the fortunes made in Otago’s gold dredging boom of the late 1890s and early 20th century. Trained at Dunedin firm Cossens and Black, McGeorge (1868-1953) held a variety of significant engineering posts. The two-storeyed house is built of brick, has a slate roof, ornate decorative detailing, and features Tudor influences in the half timbering and veranda details. Architect: J.L. Salmond. This 1907 brick and tile residence designed for Anna and Alexander Huxtable, is a beautifully detailed example of an Edwardian villa, one with historic and architectural significance. Anna Huxtable was granted the land in 1907; a survey on May 15, 1907, indicates the foundations for the new dwelling were already in place at that date. (QV: c.1910?). Alexander Murray Huxtable described himself as both a commercial agent and patent medicine manufacturer. Architect: Edward Walden (1870-1944). Likely designed for lawyer Arthur Nation (1852-1927) around 1876. In October that year, tenders were called for the construction of a “brick cottage” in the suburb of Melrose (a private subdivision in what is now known as Roslyn). However, Nation appears to have built more than a cottage: when his property was offered for sale in 1879 it was described as “a substantially-built and well-finished brick house”, its original features including hand-painted ceilings, timber joinery and stained glass. Architect: credited to John McGregor (1838-1911), and harbour engineer. Royal Terrace has a fascinating and storied collection of prominent dwellings. Associated with the prominent Hudson family. An Italianate, two-storeyed symmetrical house with a large basement, “Daisy Bank” was built of concrete and wood, circa 1897. Architect: J.A. Burnside (1856-1920). Built in the 1870s, a two-storied, two-bay Victorian residence of more than 15 rooms, with an exterior comprising plastered triple brick with quoins, foundations of Leith Valley andesite and a slate roof. Associated with the prominent Isaacs and Hudson families. Architect: Mason and Wales (likely Nathaniel Wales). Associated with prominent local politician and businessman Richard H. Leary and one of New Zealand’s most prominent artistic families, the Hodgkins. Claverton was most likely built in 1877 by local politician and businessman Richard H. Leary (1840-95). Architect: likely Maxwell Bury (1825-1912). 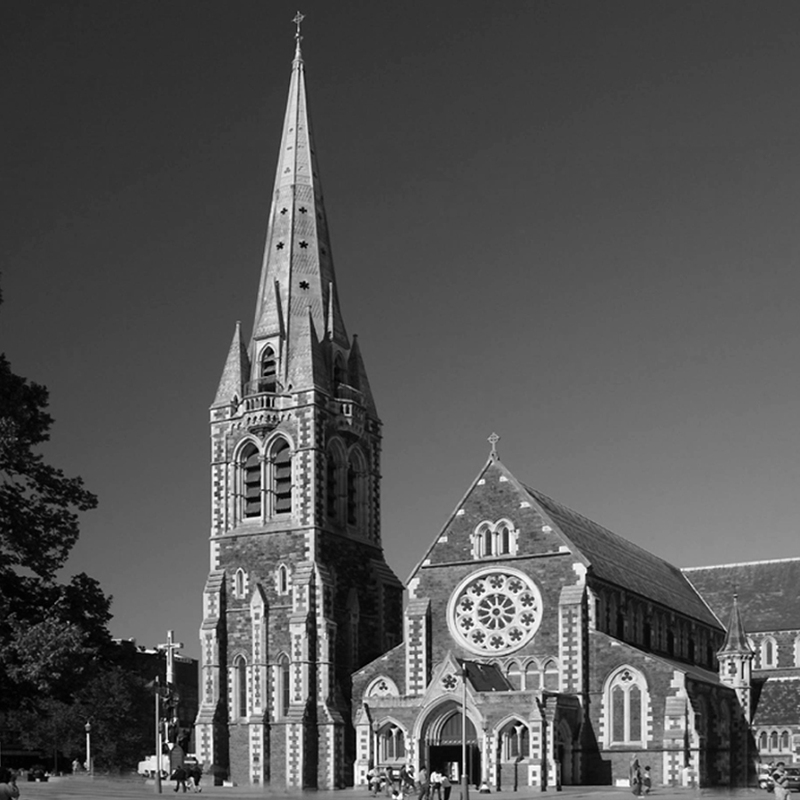 Built in the 1870s by prominent businessman, community leader and one-time Dunedin mayor Keith Ramsay (1844-1906). Named Alyth after Ramsay’s birth place, the house was completed, at the latest, by March 1875. Architect: Robert Arthur Lawson (1833-1902). It doesn’t have to be a mansion located on the high streets…. Lastly, a THOROUGHLY USEFUL guide for those unfamiliar with historic heritage archives, technical sources and search methods. Enjoyed this week’s Streets of Gold series, in which we have profiled various Dunedin houses of historic significance? Fancy playing detective and tracing the history of your home? 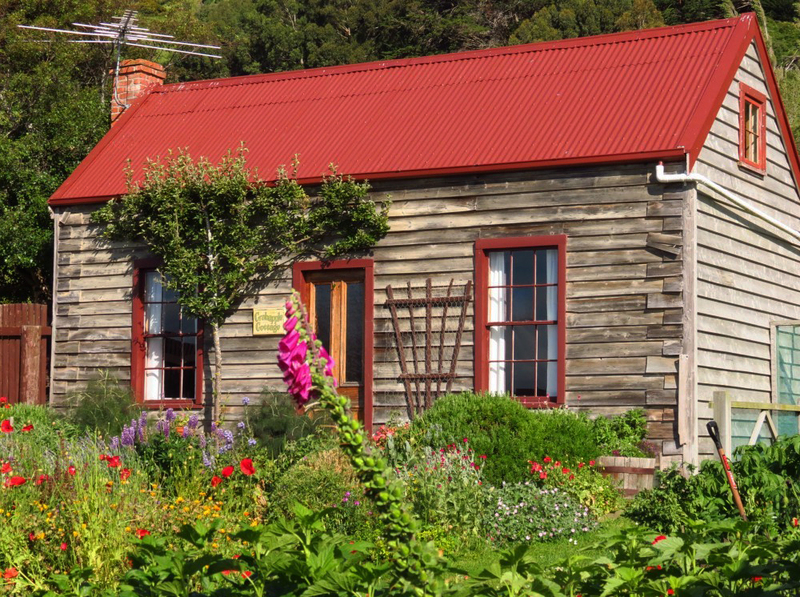 … In recent years, Heritage New Zealand has run “how to research your home” workshops in Dunedin, Invercargill, Oamaru and Central Otago. The popular seminars have drawn together the sources it uses every day to tell the story of historic places. Archivists say some people want to restore their homes to their original states, are curious about former owners or simply want to know the age of their houses for insurance purposes. 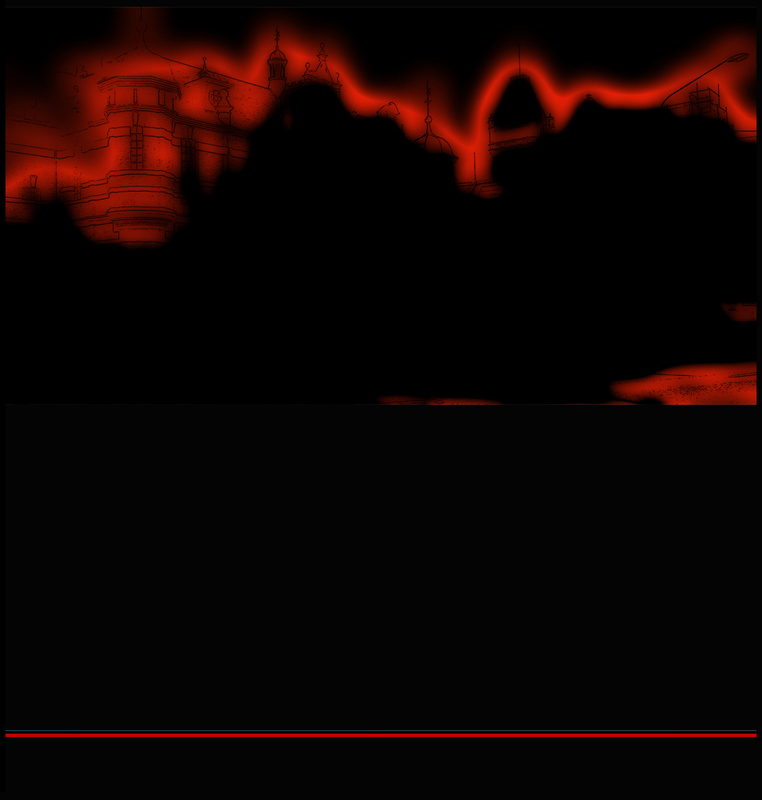 Others require archaeological assessments of pre-1901 properties or have reported seeing ghosts in their homes and wanted to work out who they might be. Interested homeowners have a wealth of resources at their fingertips….